With the Season 9 premiere of Studio C coming up fast (pssst! have you marked your calendars for September 10, 2018?! ), we wanted you to get to know the characters you'll be seeing this season! BYUtv: What do you do for fun? Susan Weebers: What do I do for fun? I like to make beauty tutorials so the whole world can be as beautiful as me. 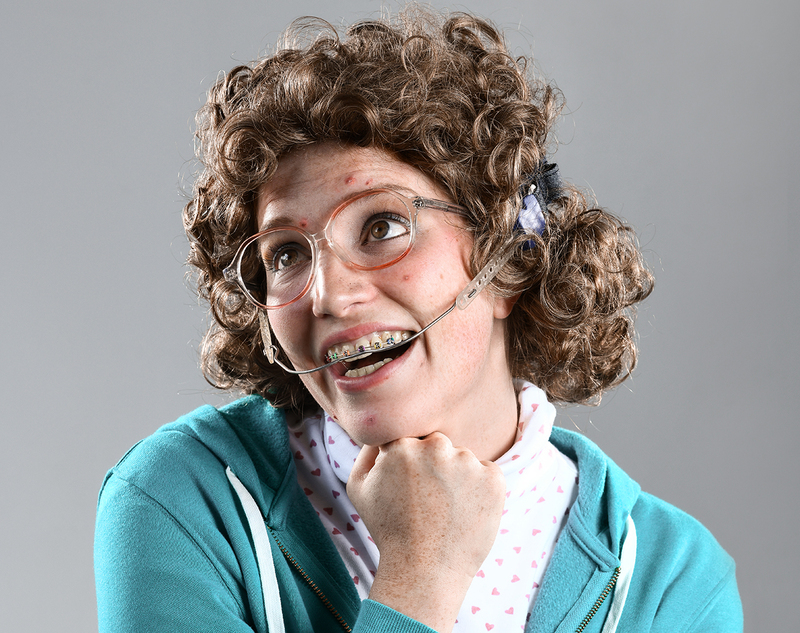 Susan Weebers: My favorite food is popcorn but I can't eat it right now because of my orthodontia. Susan Weebers: My dream career is to be a makeup artist, which I'm already doing, so, just being me. Susan Weebers: My favorite animal is probably a unicorn. 'Cause they're pretty! And sparkly. Susan Weebers: My all-time favorite movie is "Air Bud." 'Cause there's no cats in it! Shut up, Carl! Susan Weebers: The first thing I do when I wake up is start my beauty routine. I like to wash my face with apple cider vinegar 'cause I read somewhere it's good for you, so I put it on my face but it stings my eyes every morning, but pain is beauty. Susan Weebers: My favorite dance move is the "floss." 'Cause I like to floss my teeth too while I dance it. I go like this. Ah-ah-ah. Uh. I also like any move that Richard Simmons does. Richard Simmons is my idol. Susan Weebers? My favorite Studio C sketch other than mine, of course, would probably be Scott Sterling! It's really funny. I would know how to cover up his scabs. I could teach him how to look beautiful again. Poor Scott. He's famous on the Internet\ like me! BYUtv: Who is your celebrity crush? Susan Weebers: My celebrity crush is Richard Simmons. He's a dreamboat! Have you seen him? Whoo-wee. BYUtv: What is your beauty tip of the day? Susan Weebers: My beauty tip of the day is lip liner is all the rage. Try to get the darkest color you can find for the outside and the lightest color for the inside. They shouldn't match each other. While there are more Susan Weebers tips coming in Season 9, be sure to check out some of our favorite Susan Weebers tips from the past! After filling up over 3,000 seats during two live tapings in NYC with guest host Kenan Thompson, we're ready to kick off Season 9 with a bang! Tune in to the Season 9 premiere of Studio C on September 10, 2018.